I had the good fortune to stumble on a lesser-known literary descendant of the Heap. 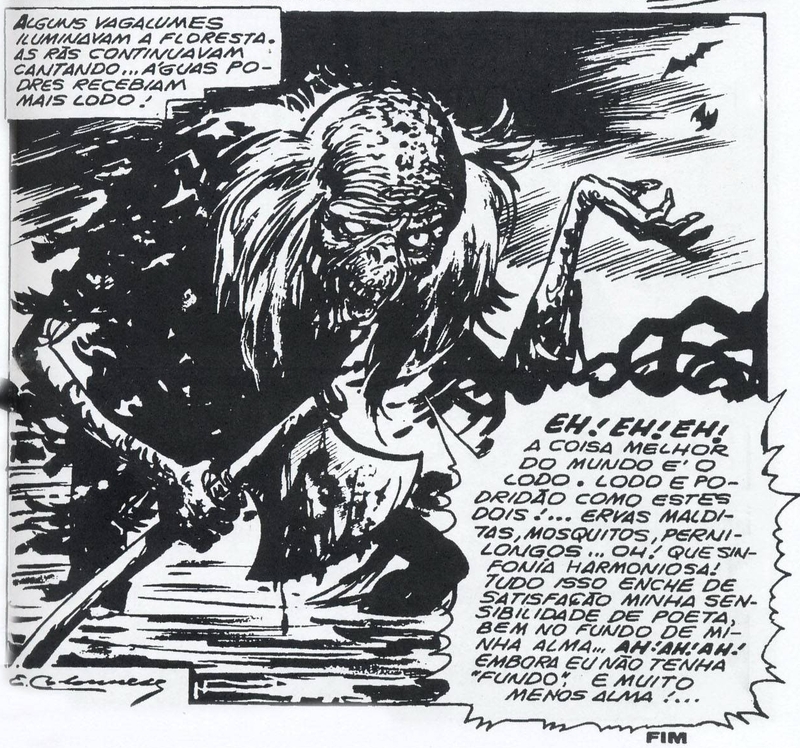 As far as I know, O Morto do Pântono (“The Dead Man from the Swamp”) has never been formally translated into English. It is a Brazillian comic, the creation of Eugênio Colonnese, a multitalented and prolific artist who wrote and illustrated movie posters, World War Two comics, created several superheroes, and was partially responsible for the widespread use of comics in Brazilian education to engage and motivate students. His most famous creation, however, is Mirza, mulher vampire (Mirza, the Vampire Woman). Mirza should be familiar to anyone who knows Warren Publishing’s Vampirella; aristocratic, voluptuous, and scantily-clad. It should be said, however, that while Vampirella’s first issue came out in September 1969, Mirza arrived in 1967. As a backup to Mirza, Colonnese created O Morto do Pântono. 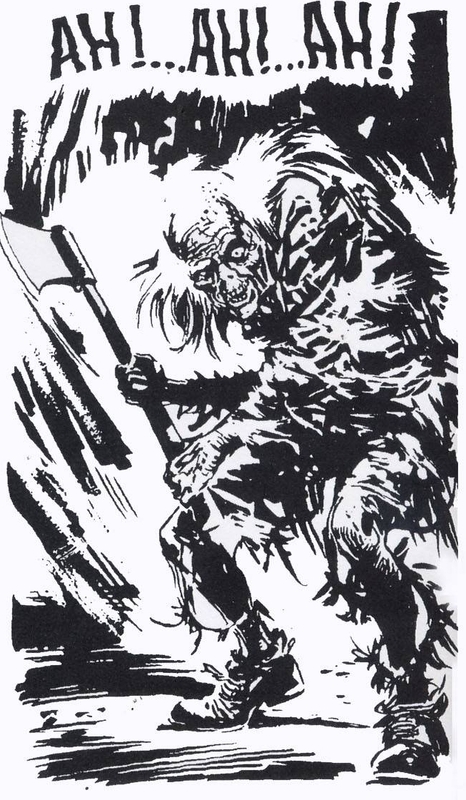 This swamp creature, which I’ll refer to as O Morto, “the dead man” has enough similarities to imply that it was inspired by the Heap. Although I cannot make a direct connection, O Morto is a human-derived, but dead creature of the swamp. In the same way that the Heap’s later stories were structured, O Morto is a vessel of narrative justice via retribution, although O Morto’s methods aren’t quite as varied as the Heap’s. It seems to have inhuman strength despite the spindly nature of its limbs and short, hunched torso. Like the Heap and most swamp creatures that follow it, O Morto is immune to bullets. At the same time, the character has enough dissimilarities to give O Morto his own flavor. Unlike most comic book swamp monsters, and again ahead of later muck men like Swamp Thing and Sludge, O Morto can reason and even talk. Although its skin is heavily textured, where that of regular people is undecorated, it retains a more human shape than the Heap or Man-Thing, even with a halo of hair with a balding pattern. In another departure, O Morto does not wander far from his swamp. The Heap’s stories were set in locations across the globe; Africa, China, the Middle East, American and Europe. O Morto remains where he is, and waits for the evildoers to come to him. And come they do. Blackmailers, marijuana smokers, and other bad men. Uniquely among the muck monsters of comics, O Morto always carries an enormous single-bit axe. As the name implies, O Morto regards himself a dead person. His immunity to bullets seems to back this up. It isn’t until 1985, nearly two decades after O Morto’s first appearance, that his origin his even hinted at. 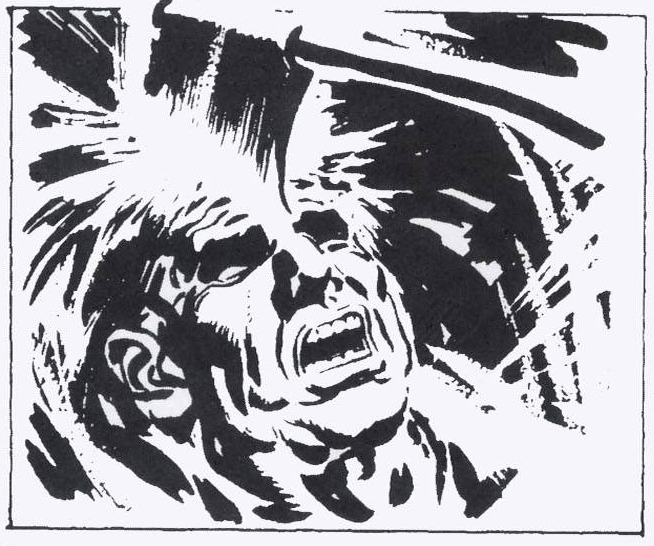 In "Bodies Without Heads Do Not Speak," a legend is recounted that O Morto was once a judge who was dragged to the wetlands and killed with an ax. His subsequent resurrection is left as a mystery, but this explains some of the moral yet harsh nature of his justice, and his territoriality. Despite this new understanding of the character's background, he solves his problems in the the same way, an axe-blow to someone's head. Unlike Dr. Ted Sallis who became the Man-Thing, Dr. Alec Holland who became the Swamp Thing, or Baron von Immelmann, O Morto does not seem to be highly educated. Judges of this period in Brazil were not required to have a law background, merely to pass a test on the local laws. He’s a bit more down to earth than the previous lives of other of the Heap’s literary descendants. In this way, O Morto seems to presage such slasher fare such as Jason Voorhees. But where Jason varied his implements and tended to merely start with the immoral youths and move on to their friends, O Morto just goes after the bad people. With a huge axe. He occasionally meets people who are not reprehensible, Sílvia in “Little Sílvia” as well as Bernardo in ”Bad Smell.” He does not kill indiscriminately. Only those he believes are bad. As such, his stories tend to follow the mid to late Heap style of story. A bad person goes into the swamp, only to be violently foiled. O Morto is also the only supernatural element in the these stories. Everything else is strictly noir or crime. Another interesting quirk that sets O Morto apart from other swamp monsters is its tendency to speak directly to the reader, likely reflecting the hosts of EC’s fifties anthologies, the Vault-Keeper, the Crypt-Keeper, and the Old Witch. O Morto does double-duty, however, serving both as character as well as narrator. In the earlier stories, he has a splash image taking up the majority of the page, usually delivering a ghoulish or misanthropic message. In “The Gnats” he doesn’t actually appear in the story, serving instead as an outside observer of human wickedness and cruelty. "A coisa melhor do mundo e o lodo. Lodo e o podridao como estes dois! Ervas malditas, Mosquitos, pernilongos, oh! Que sinfonia harmoniosa! Tudo isso enche sde satisfacao minha sensibilidade de poeta, bem no fundo de minha alma! Ah Ah Ah! Embora eu nao tenha "fundo" E muito menos alma!" With ten, or possibly eleven, published stories between 1967 and 1968, Morto went dormant in the seventies, with the exception of a single story published in O Vampiro in 1974. 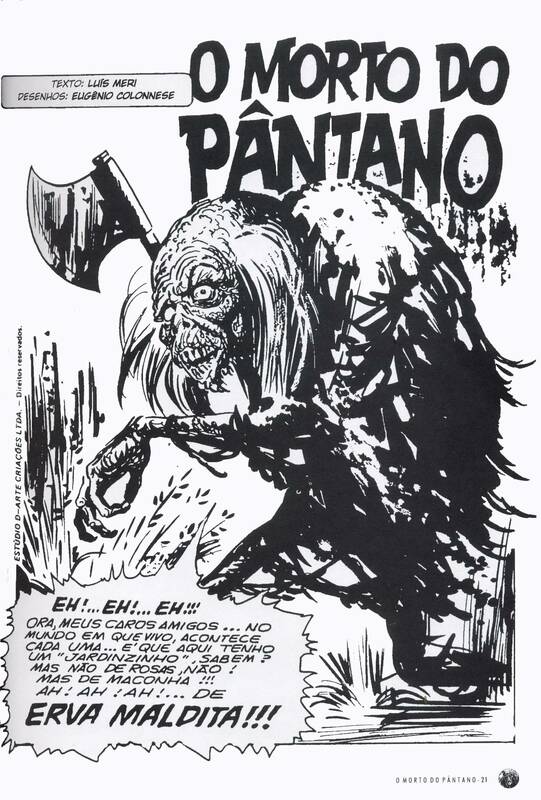 But like Swamp Thing and Man-Thing, O Morto do Pântono was revived in the early eighties. 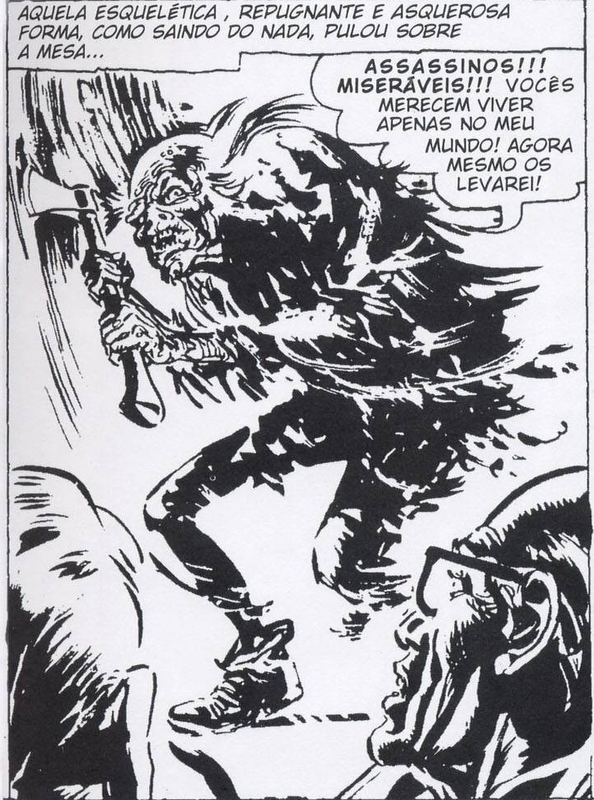 Eight new stories were written for the Brazilian comics Spektro, Calafrio ("Chill"), and Mestres do Terror. 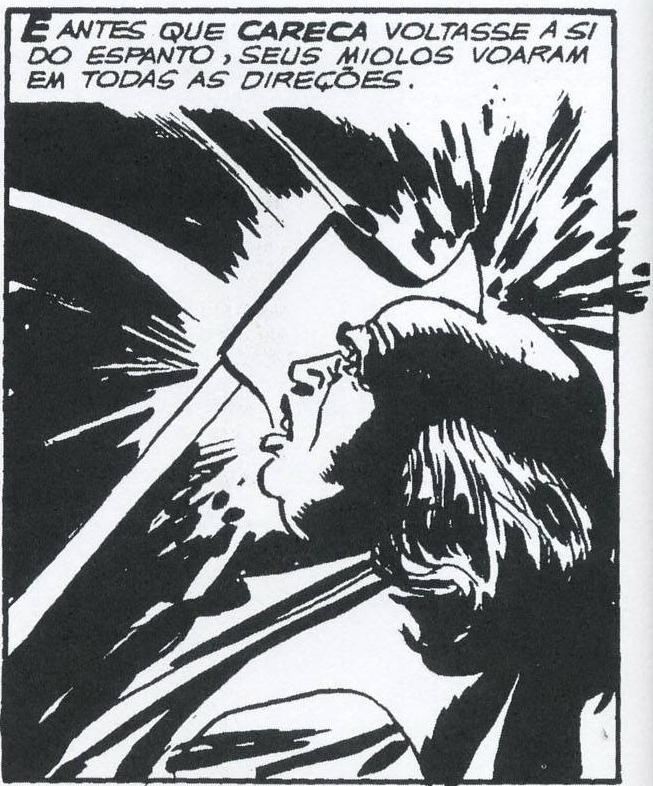 One final story, “The Night 0f the Kidnappers” was created, for the Mirza, A Vampira, collection from Opera Graphica in 2002, with a script by Franco de Rosa. The final story of Morto, and the one in which Mirza and O Morto finally meet. What makes these black and white stories stand out so much is the life, if you’ll pardon me, and energy that Eugênio Colonnese imparts to his creation. The swamp is lit like a noir film, dark and white, with no grey tones. Although I suspect this is a necessity of the printing process originally used, Colonnese’s art makes fantastic use of the medium. The line work is reminiscent of both Bernie Wrightson and Steve Bissette, fine and frenetic in places, other times using broad gestures to suggest more than is actually present on the page. Colonnese has a fine eye for the grotesque, and constantly creates memorable images. I could only get my hands on the 2005 release, O Morto do Pântono, which contains seven of the twenty stories, and I’m a bit sad that I have been unable to locate any more of the stories. But pursuing this would involve a search for forty-year old comics in a country I’m more than twenty-seven hundred miles away from, and in a language I don’t understand. Additionally, there seems to be a contradiction in the introduction: three of the stories, “Hellish Herb” “The Gants” “The Red Jalopy” all bear the by-line of Luis Meri, but the history section claims they were written by Luis Quevedo. For all I know Mali is a pseudonym for Quevedo, or vice-versa, but it’s not something I have been able find any information on. I would send queries to the publisher, but Opera Graphica ceased operations in 2009. It has been suggested by Amazon reviewer Lawrance Bernabo in his review of Swamp Thing: Dark Genesis that Swamp Thing was inspired by O Morto do Pântano, but it seems very unlikely. Though O Morto was created in 1967, I can’t find any evidence that it was ever translated into English. 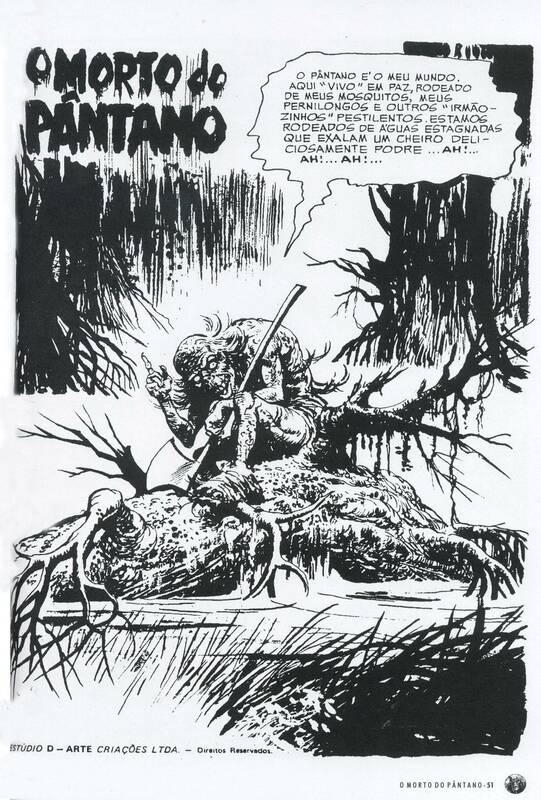 Further, I have not been able to find any reference to Len Wein or Bernie Wrightson, (the same for Roy Thomas, Gerry Conway, and Grey Morrow, creators of Man-Thing which famously and contentiously debuted months before Swamp-Thing did) mentioning O Morto when they recount the origins of their muck monster. And given what an exhaustive job Jon Cooke did interviewing those creators for the monumental and extremely thorough Swamp Men book from Twomorrows publishing, I find it very unlikely that they wouldn’t have mentioned it. I was extraordinarily pleased to come across O Morto do Pântono, because I love the all the permutations of Hillman’s The Heap. O Morto is another very entertaining, unique offshoot from the Heap’s fecund trunk. There’s a charm to the stories, and Colonnese’s art is stunning. Hopefully, and perhaps this article will help, the character will get more of the exposure that it deserves. I would love to read the rest of O Morto’s stories. O Morto appeared in twenty different stories, spread out over thirty-five years. Only seven appeared in the eponymous collection which was published by in 2005. I won’t include a list of the illustrations that appear in various magazines, although the Opera Graphica editors note a number them for their complete history of O Morto. All stories were illustrated by Colonnese. Stories in bold appear in the Opera Graphica collection.